I don’t like having more than one of anything. Feels wasteful. I mean, one hairbrush will do. 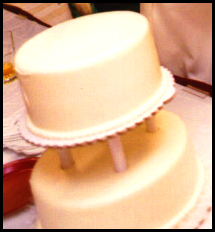 My wedding dress and cake had no decorations, no ribbon or flower. Nothing. In my day-to-day, I map out the most efficient route for errands. Lose time and you’ve lost what’s irretrievable. I like to keep on the spare side of things. It hit me that the way I relate to money and time is how I write. I try to work each word full tilt. I love having guest writers see they can toss two, three hundred words to find the heart of their story. Of the 42 who have come through these doors, virtually all have sworn they have “cut to the bone” and just can’t reach the word limit I set. I plunge my knife, head straight for the marrow, send them the bloody remains. Yes, laughing like Cruella De Vil. My toughest critic, I stripped a short February post of a dozen words last night – and nodded in approval. Cleaner, tighter. I do my best to preserve the unique voice of every contributor, which is why we have had 42 different voices in the repertoire. No one has to or should sound like me. Goodness, not with the literary greats to emulate. But I believe we can apply principles of efficiency no matter what our style. Because we writers and poets love our words so much, we tend to err on the side of overstating and in our earnestness, try too hard. We all know less is more but my guests still scrounge for the anesthesia when they see the knife. Which reminds me. I need to wipe that blade. This entry was posted in Writing and tagged Author, Blog, Blogger, Blogging, Blogs, Communication, Creative Writing, Fiction, Poetry, Success, WordPress, Words, Writer, Writers. Bookmark the permalink.